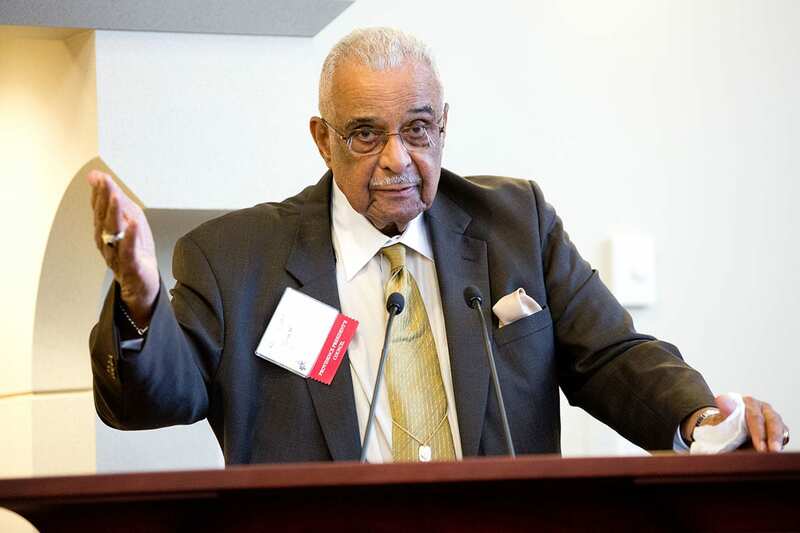 Dr. Kenneth Walker ’57 & ’83Hon. expresses gratitude to family, colleagues, and friends during the reception in his honor. More than 100 members of the Providence College community, friends, family members, and former colleagues gathered in the Ruane Center for the Humanities to honor Dr. Kenneth Walker ’57 & ’83Hon. for his dedication to urban youth and education and to celebrate a scholarship that ensures those commitments will endure. The Dr. Kenneth Walker ’57 Family Scholarship Fund provides financial support for African- American students majoring in education at PC. The scholarship fund was established in 2008 by John Murphy, founder of Home Loan Investment Bank, FSB, in Warwick, R.I., with gratitude for the thousands of people Walker inspired. That gratitude was evident at a recent reception as guests, including Rhode Island Supreme Court justice Maureen McKenna Goldberg ’73, state legislators and officials, fellow educators, and students, paid tribute to a man who kept youths in school, made sure they went to college, and taught life lessons along the way. During the reception and speaking program, many shared stories about Walker’s care, compassion, and dedication to others through his teaching, coaching, civic activities, and mentoring. Walker is joined by, from left, Jaida Judge ’17, John Murphy, and Tashiyra Freeman ’18. 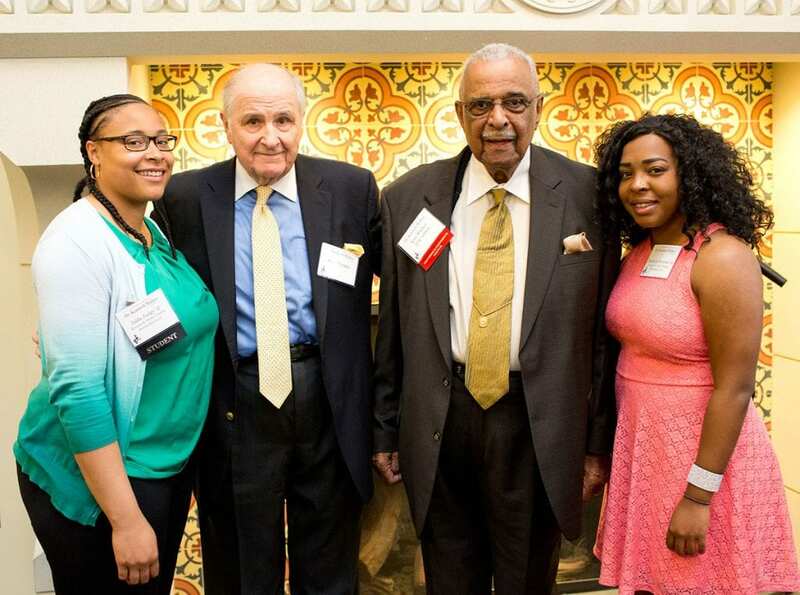 Judge and Freeman are recipients of the Dr. Kenneth Walker ’57 Family Scholarship established by Murphy. After graduating from PC as an education major, Walker earned a master of education degree from Rhode Island College and a doctorate in education from Boston University. He was a teacher, coach, guidance counselor, and administrator in the East Providence public school system. He later became a professor of secondary education at RIC and an adjunct professor in the Graduate School of Education at Johnson & Wales University in Providence. When Walker was graduating from PC, he told Rev. Robert G. Quinn., O.P. ’63Hon. that he wanted to teach. Father Quinn, who taught English and education and was chair of the education department at PC, spoke to the superintendent in East Providence “and started me on this beautiful journey I’ve been on. The Dominicans were so helpful, so supportive,” he said. Walker currently serves on the College’s Providence President’s Council. He received the National Alumni Association’s Exemplary Citizenship Award in 1993. 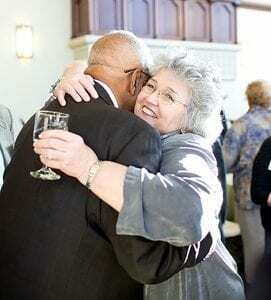 Walker is hugged by Hon. Maureen McKenna Goldberg ’73, a Rhode Island Supreme Court justice. Murphy first met Walker in the 1950s. Years later, when Murphy was a Ward 1 city councilman in Providence, Walker served on the Rhode Island Parole Board — a seat he held for more than 34 years, serving as chair for six. Murphy always remembered Walker’s fairness and compassion. Walker also was committed to youth in his civic work as president of Big Brothers of Rhode Island and as a member of the Teen Drug Court of the Rhode Island Family Court. After having a conversation with College President Rev. Brian J. Shanley, O.P. ’80 about 10 years ago, Murphy decided to honor Walker for all he had done for his community by establishing a scholarship fund in his name. A retired basketball referee for the NCAA and the Rhode Island Interscholastic Leagues Walker encouraged promising players to attend PC. Harold Starks ’86, PC athletics alumni relations and development coordinator, who played basketball for the Friars, met Walker when he officiated at practices. “He had a lot of wisdom and knowledge. He told stories that taught life lessons,” said Starks. Walker has been a teacher, mentor, and a father figure who taught him about a different kind of leadership, said Starks. “You don’t have to be in the front to be a leader. You don’t have to be the loudest. You can be a leader in the middle or in the back of the line,” said Starks. 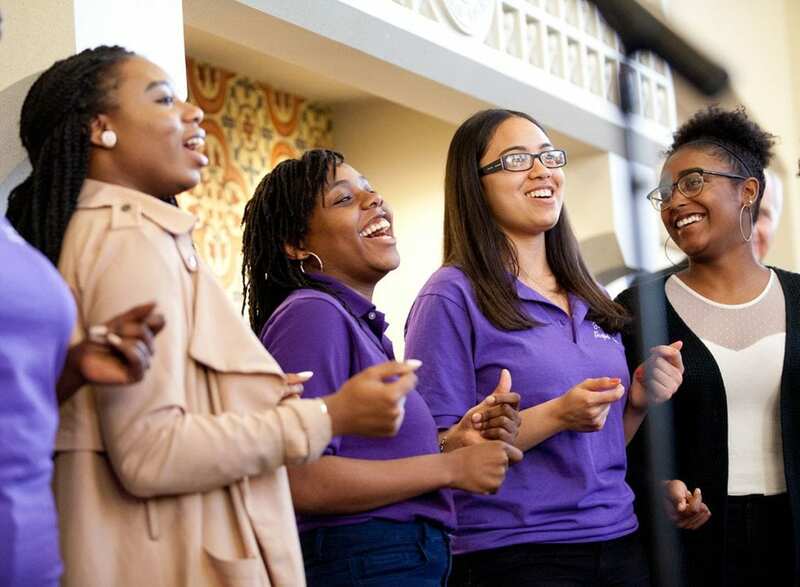 As the last of the day’s bright sunlight beamed through the windows of the Fiondella Great Room, the College’s Footprints Gospel Choir performed for the group gathered in Walker’s honor. One of the speakers, Vendita Correia ’13, the first Walker Family Scholarship recipient, is completing her first year at Tufts University School of Dental Medicine. Footprints Gospel Choir members honor Walker in song. Father Shanley recalled the creation of the College’s mission a century ago to be a school of opportunity for those who might not have been able to attend college. Providence College, he said, is still such a place where students’ lives and futures are built. Murphy spoke proudly of his 60-year friendship with Walker, whom he said “graduated from PC in 1957 but never left.” Murphy said he established the scholarship for education majors because “teachers are strong role models for students to complete their education.” Five students have been awarded scholarships to date, including two current students. Later, Walker spoke about why he has devoted his life to helping others. “Since I was a child, someone always reached out to me, if no more than to say, ‘Hello, how are you doing in school?’ I said, when I get older, I’m going to do that. I’m going to talk to kids,” he said.